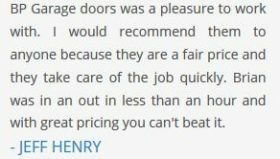 While garage door maintenance isn’t a daily requirement, it shouldn’t be ignored either. Your garage door carries value for your home and provides protection and safety to your assets and family. 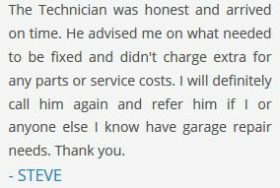 Keeping up with garage door maintenance not only saves you money, but also saves you the downtime. A smoothly working garage door is a happy garage door – A newer garage door or one that was recently serviced usually has parts that are lubricated and cleaned, this helps maintain the integrity of the rollers, tracks and hinges. Keeping these parts oiled and functioning properly is the key to making sure your garage door opens and closes properly. At least once a year oil these parts to make sure all the components that require lubrication are lubricated. Additionally, keep your corners clean and free of cobwebs, dirt and grime by using a broom or leaf blower to clean those areas. Keeping your garage FLOOR clean helps everybody! – The last thing you want is for somebody to slip, fall or get hurt in your garage. Often times there may be oil from your vehicle which could cause someone to lose their balance if walked over too quickly without noticing. Also make sure to remove anything from the middle or sides that may obstruct the pathway of a vehicle coming into park. This includes tools, bikes, equipment, toys and other home appliances. Overtime dust will settle and the floor may need a sweep every week or so to keep the overall floor looking nice. Your garage walls are the foundation, don’t forget about them! – The walls of your garage are not only the foundation of your garage, but the entire home. Inspect the walls semi-annually (twice per year) for any cracks or water damage (moisture). Mold could also begin to accumulate if not treated noticed immediately. A good rule of thumb is anything that is larger than a hairline crack should be something to take seriously and consider. You also want to make sure the ceiling and falls are level. If you notice any portion of the wall or ceiling that is sticking out or uneven, call BP Garage Doors to have your garage inspected. Garage gutters and doors are important – At least one time every year you should inspect the garage side entry door to make sure it is working properly, that the door is weatherstripped and that it closes and locks correctly. Your garage gutters should also be cleaned every spring and fall to ensure longevity and cleanliness. You also want to inspect for damage or cracks. You can also check the roof for missing tiles or shingles while you are up there to knock out two birds with one stone. Critters find comfort in garages – Check for Pests – Insects like ants and termites can really damage your garage if left alone. Take a look at all the dark corners if your garage to make sure you aren’t being invaded. We recommend calling pest control if you notice any signs of pests to have it taken care of immediately.